Tractor ballasting influences the efficiency and energy use of tractor operation. Ballasting determines the amount of slip in any given field condition, affecting fuel consumption, field operation time, and tire wear. Total tractor weight also has serious effects on compaction, transmission life, tire life, and tractor safety and stability. In addition to the overall weight of the tractor, the way that the weight is distributed between the axles has a huge impact on tractor performance. Over-ballasting a tractor wastes fuel due to increased rolling resistance and increases drive train wear and soil compaction. Under-ballasting a tractor wastes fuel from excessive tire slip and causes premature tire wear. Slip is controlled by adding or removing ballast from the tractor to obtain the desired slip. If slip is lower than 10%, ballast needs to be removed from the tractor. If slip is higher than 20%, more ballast needs to be added to the tractor. One way to determine slippage is to compare the number of rear wheel revolutions when the tractor is not under load with the number of revolutions under full load. For information on measuring wheel slip, see the article Optimize Wheel Slip to Save Fuel. 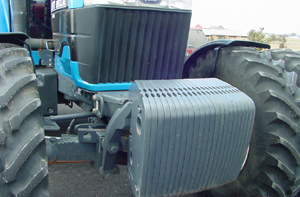 Most of the tractor weight should be positioned over the drive axles. In the case of 2WD tractors, the front axle must carry enough weight to provide steering control and stability. FWA tractors require more weight than 2WD tractors on the front axle to provide traction for the powered front wheels. True 4WD tractors should have equal amounts of weight on both drive axles while operating under load. Because of weight transfer, 4WD tractors should be ballasted with more weight on the front axle. The table below lists the recommended weight distributions for various tractor configurations. Wheel slip should be checked in the field to refine the ballasting requirements. When adding or removing ballast, the proper weight distributions must be maintained according to the tractor type. Care must be used when ballasting; do not exceed the tire’s recommended load carrying capacity. Tables in tire manuals list maximum loads according to tire size, type, and inflation pressure. Using dual tires does not allow the maximum loads to double. Maximum loads when using dual tires are generally 88% greater than when using singles only. Tire loading tables will list duals separately. If loading tables do not list duals, calculate dual load capacity by multiplying 0.88 times the load capacity for singles. Consult the operator’s manual for the ROPS (Roll Over Protection Structure) limits. Make sure that the total weight of the tractor (including ballast) is less than the maximum ROPS limits. The ROPS is designed for a maximum tractor weight and could fail if the ballasted tractor weight exceeds the limit. Many types of ballast can be used to add weight to a tractor. Cast iron weights are the most convenient and can be changed according to ballasting needs. Adding fluid as a calcium chloride solution to the drive tires is more economical than cast weights; however, fluid is much harder to change. Cast iron weights are a convenient type of ballast that can easily be changed according to ballasting needs. The amount of liquid ballasting that can be added depends on the size of the tires and the concentration of the calcium chloride solution. Tire manuals will list the added ballast for different tire sizes. Three different concentrations of solution may be used, and the amount of ballasting will depend on the concentration used. Most tire manuals will list the added ballast for a 75% fill. Care must be used not to overfill the tires with solution; some air space must be left to account for volume changes. Fill only the inside duals with ballast fluid. Ballasted outer duals are difficult and dangerous to handle if they need to be removed for repair or certain operations. Ballasted outer duals also increase the stress on the outer tires, axles, and power train components. Ballasting non-powered front tires is not recommended because of possible steering and control problems especially at transport speeds. The added weight of dual tires must be added into the total weight of the tractor. Dual tires can add a significant amount of weight to the tractor. Heavy cast or light steel hubs and wheels can be used on most tires, so the type of wheel and hubs used can significantly vary the amount of weight added with each tire. Ballast is the important link between field speed and drive wheel slip. Too much ballast can create power loss from increased rolling resistance, soil compaction, and high mechanical loading on axles, bearings, and the drive train. Insufficient ballast can create too much slip, high tire wear, and lost productivity. What is the correct drive wheel ballast? One that results in optimal slip. The following three steps will help select the proper ballast while optimizing field speed and drive wheel slip. Select a relatively high field speed, above 6 mph. Select an implement width that matches this speed with the available drawbar power of the tractor. Ballast the drive wheels to obtain a slip that is near the optimal slip for the particular soil conditions (refer to Fig. 1 in the article Optimize Wheel Slip to Save Fuel and the tractor operator’s manual for specific values). New Publication Helps Farmers Conserve Energy with Tractor Ballasting – from Iowa State Extension.